EOS has seen a rough 24-hour period of trading, falling by 10% and bringing the current trading price down to around $5.32 at the time of writing. This price decline can largely be attributed to the recent drop of BTC into the $5,000 support region. How to buy EOS (EOS) on Binance? Nevertheless, EOS is still up by a total of 45% over the past 30 days and is up by a very impressive 121% over the past 90 trading days. The cryptocurrency project, that had raised $4 billion in its ICO, is currently ranked in 5th position in the market cap rankings as it holds a $4.83 billion market cap. EOS is extremely close in market cap to both LTC and BCH, as the trio of coins has recently been shuffling in spots 4, 5 and 6. Taking a look at the daily chart above, we can see that EOS has been consistently rising all throughout 2019. The market had broken above the 100-day moving average in February and has since continued to rise higher. 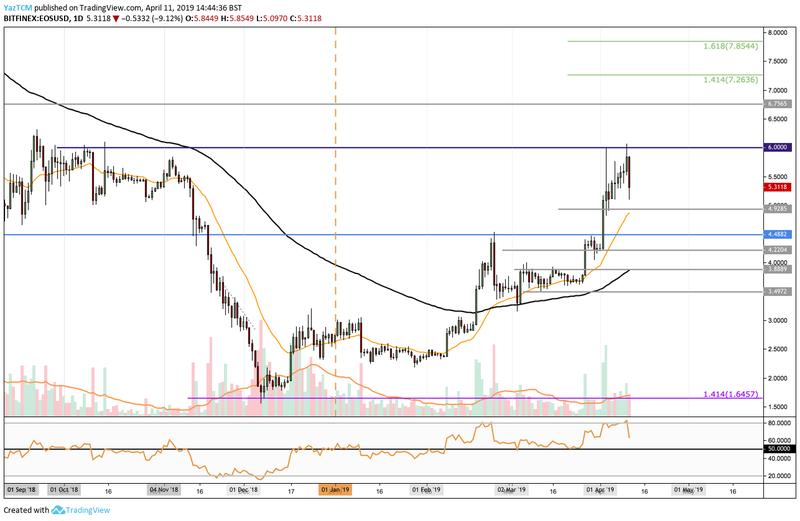 The token had placed a fresh 2019 high in yesterday’s trading session after the EOS market was able to spike above the $6.00 resistance level. However, we can see that during today’s session the market rolled over and has fallen into the $5.30 region. The recent price drop has now caused the short term trend for EOS to shift into a bearish condition. If the sellers continue to cause price action to drop further lower, we can expect immediate support beneath the market to be located at the $5.00 – $4.92 region. Beneath $4.92, further support can then be located at the $4.48 level, previous resistance now turned support, followed with more support at $4.22, $4.00 and $3.88. The support at $3.88 is significantly bolstered by the 100-day moving average level which is currently hovering within this price region. The medium-term trading condition remains bullish. The recent break above the previous resistance at $4.48 has caused the medium term to remain bullish for EOS. However, this will be invalidated if EOS drops beneath the $4.00 level. After the current pullback has been completed and the bulls start to push the market higher, we can expect immediate strong resistance above to be located at the $6.00 level. A break above $6.00 would cause EOS to create a fresh 6 month price high. Above $6.00, initial resistance is located at the $6.75 level. If the bullish pressure can continue to drive EOS/USD above $7.00, we can then expect higher resistance to be located at the short term 1.414 and 1.618 Fibonacci Extension levels (drawn in green) priced at $7.26 and $7.85, respectively. What Are The Technical Indicators Reading? The RSI has recently slipped lower from overbought conditions, which is a good sign. When the market is overbought, there tends to be less room for the market to travel higher. However, now that the RSI has fallen, EOS/USD has space to climb further higher above the $6.00 level on the next push. So long as the RSI does not break beneath the 50 level, we can expect the medium bullish trend to continue for EOS. 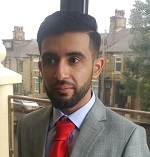 Yaz is a cryptocurrency technical analyst with over seven years of technical analysis trading experience. As an Economics graduate, he has taken a keen interest in the future potential of blockchain in the financial industry. Removing crypto from the equation, Yaz loves to watch his favorite football team and keep up-to-date with the latest fights within the UFC.